In the belief that bigger is better, we sometimes overlook the beauty that small fruits can bring to the garden. A prime example of this is the red and white currants. The bushes are highly ornamental and provide visual appeal, take up a relatively small growing area, and provide plenty of fruit for eating fresh or making into preserves and pies. Under ideal conditions currants grow quickly, reaching a height of 5 - 6 feet, and can produce 10 - 12 lbs. of berries per bush. If space in your yard is at a premium, the bushes can be trained to a standard form that can be tucked into virtually any garden area. Red currants (Ribes sativum) have beautiful red, tart berries growing in grape-like clusters. The white currant is a sport of the red, and has translucent berries with a delicate flavour. Currants are winter hardy, and will grow in most climatic zones. An added bonus is that they can be grown in areas that may be too wet and shady for other fruit. Currants grow well in most soils, although the preference is for a heavier soil, with a pH of 5.5 - 6.7. A dressing of lime can be added to the soil if it is too acidic. Two-year old bushes can be planted in early spring or fall. For fall planting in colder areas, mound soil around the base of the plant to avoid heaving of the soil in winter. Prepare the soil by removing all perennial weeds that may be difficult to remove later without damaging the roots of the plant. Dig a hole large enough to allow the roots of the plant to be spread out. Fill the hole with a mix of soil and compost or aged manure, then water in and tamp the soil firmly around the plant to remove air pockets. Currants are self-pollinating, bearing fruit at the base of one-year old wood, and on spurs of two and three-year old wood. Each fall prune back the four-year old canes, and encourage new growth yearly to maintain a balance of one-, two- and three-year old wood. A number of pests may bother the currants. To deter over-wintering pests, spray with dormant oil when the bush is dormant, then spray with lime-sulfur just before the flowers open. The currant worm may defoliate the bushes. Once you notice the leaves are being chewed, search for the tiny green worms. A good dusting of rotenone is effective, as is hand-picking, or giving the bush a good, hard shake. The currant borer does its damage on the inside of the cane. The larvae feeds on the pith, then emerges as a moth in the spring. A telltale sign of borer damage is the tip of canes wilting and dropping their leaves. Cut the cane back, then burn the infested wood. Wormy fruit is the work of the currant fruit fly. Infested berries will have a discoloured area where the egg was inserted by the female fly. The damaged fruit falls to the soil, then the maggot burrows into the soil, and emerges as a fly in spring. Be certain to remove all fallen or damaged fruit. Red and white currants ripen in mid to late summer. 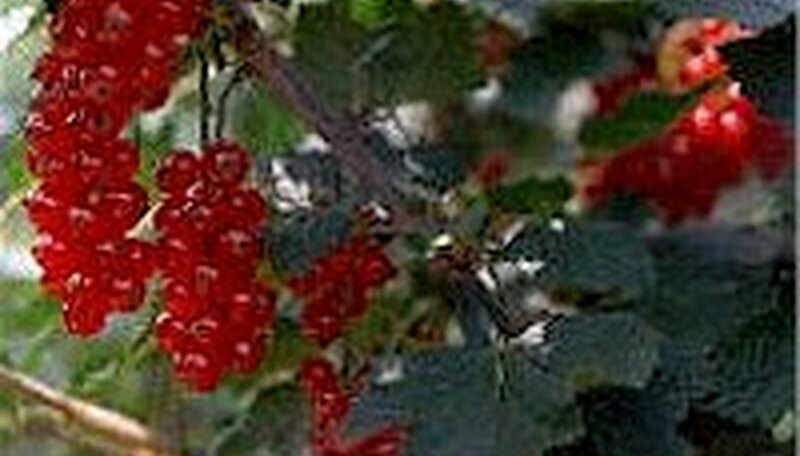 When ripe, the berries are clear red or translucent white. To harvest, pick the entire cluster as the fruit is very delicate. The clusters can be frozen whole for jelly or juice. Nutritionally, currants are high in Vitamin C, and also contain traces of Vitamin B, iron, and phosphorus. Discover for yourself that bigger isn't necessarily better. Give these beautiful small fruits a spot in your garden, and you'll reap rewards that are visually and taste appealing!